The European Commission is encouraging Member States to work together on research into a range of topics that pose a challenge to European citizens now and in the years ahead, because European researchers can achieve more results and make better use of public funds through research cooperation and RDI programming coordination than by working separately. The Joint Programming Initiative on water works to get participating countries to coordinate their individual water research agendas with a European-wide strategic research agenda on common research questions to be solved. It will increase cooperation between European water professionals through sharing resources, building networks and involving all stakeholders in the development of its activities. To facilitate this dialogue, the Water JPI has set up a Task Force dedicated to Interactions with the EC. 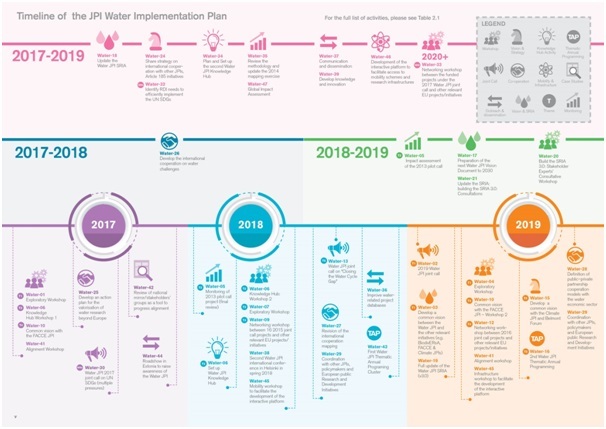 In March 2017, the Water JPI published its Implementation Plan for the period 2017-2019. The purpose of the document is to guide the operations of the Water JPI. Recommendations to other European Union funding programmes (section 3.6). Horizontal activities, which are proposed activities, not specific to a particular theme of the SRIA, but that instead progress principal JPI activities (e.g. update of the SRIA, mapping of RDI funding, international cooperation, outreach and dissemination, etc.). 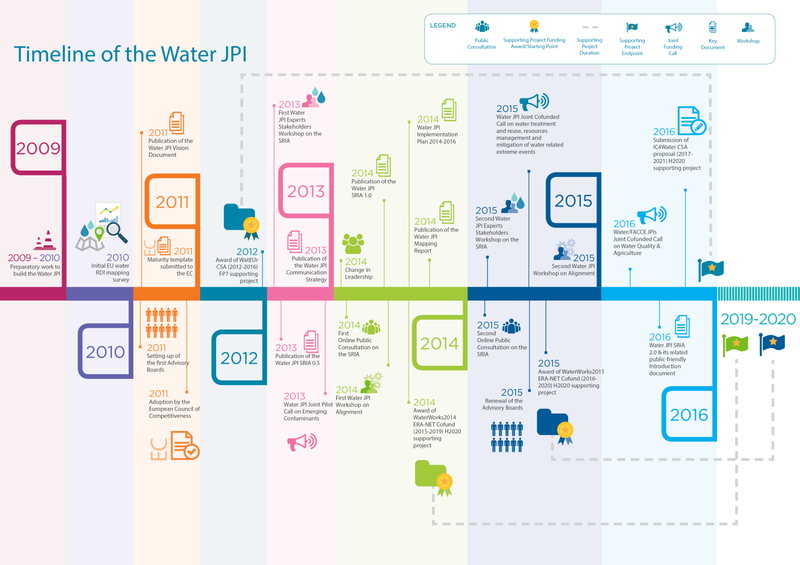 The WATER JPI Implementation for the period 2014-2016 focuses on activities classified into three types: interfacing with society, empowering research and innovation actors, improving the RDI programmes. Calls for proposals on water research and innovation issues able to contribute to the alignment of the national and regional water RDI programmes, and to the development of the Strategic Research and Innovation Agenda. A new Implementation Plan is under discussion for 2017 – 2019. It should be approved at the Vienna Governing Board meeting (29 November 2016). Progress towards alignment of national research agendas, which is a crucial priority enabling the optimal use of national research funds. 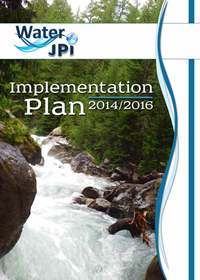 Agreement on a common Vision Document, which outlines the objectives the Water JPI is aiming to achieve by 2020. The development of the Water JPI Strategic Research and Innovation Agenda (SRIA), which lays out specific RDI needs to tackle the Water JPI grand challenge. The extension of the Water JPI membership to build a greater critical mass, which is required to provide an effective response to major societal challenges and to strengthen the European Research Area. Establishment of the Water JPI Advisory Boards: Scientific and Technological Board (STB) and Stakeholder Advisory Group (SAG), to extend its partnership and involve multi-stakeholders. The development and consolidation of international cooperation, starting from the level of European countries and widening the reach of the JPI to tackle Research, Development and Innovation (RDI) needs at a more global scale. The first development actions targeted seven countries (Brazil, Canada, China, India, South Africa, United States and Vietnam). Strengthening the focused EU leadership regarding water RDI activities through publishing of several position papers, interacting with other EU initiatives, and creating synergies between them. Completion of a comprehensive EU water RDI mapping report, including the creation of a Projects Database to better understand the European water-related RDI activities and take stock of national and regional research strategies, policies and programmes in the EU. The launch of three Joint Calls for Proposals in 2013, 2015 and 2016 (under final stage of evaluation). So far, 23 projects have been funded, with a total budget of approx. €24.9 million. Establishment of a Dissemination Strategy since 2013, to implement and develop the Water JPI communication platform to reach different types of stakeholders and facilitate the engagement of the public at large. 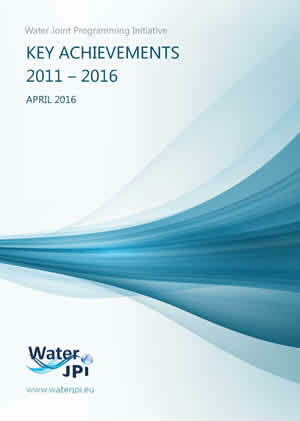 Read More: 2016 Water JPI Key Achievements document.